A complete overview of polished concrete floors, including benefits, design options, cost, and maintenance. Polished concrete is fast becoming the ultimate no-wax flooring material. 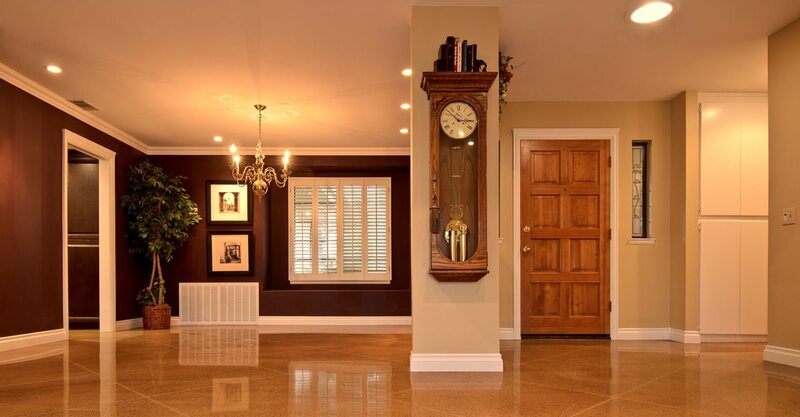 With the proper floor polishing equipment and experience, contractors can grind concrete floor surfaces, whether new or old, to a high-gloss finish that never needs waxes or coatings. Factor in the superior durability and performance of concrete, and it's no wonder why more retail, commercial warehouse and office facilities, and even homeowners are catching on to the appeal of these smooth, high-luster floors. Polished Concrete Pictures Browse our collection of photos showcasing polished concrete flooring in homes, restaurants and more. 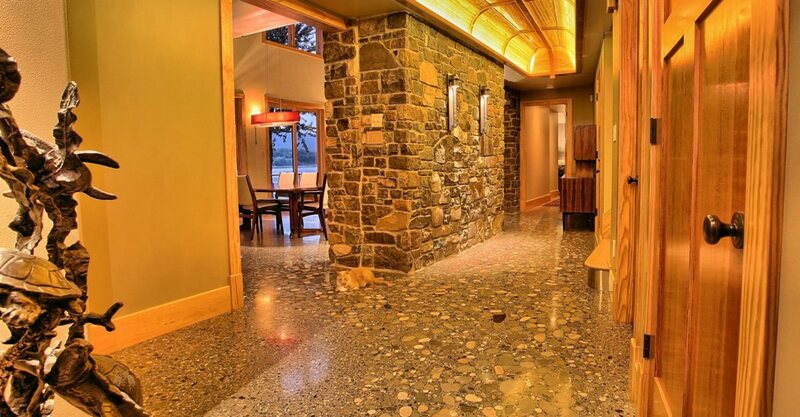 Polished Concrete Cost How much does concrete polishing cost? Find out average prices and what design features contribute to the cost. Can all Concrete be Polished? Find out whether or not your concrete is a candidate for polishing and how to achieve good results. 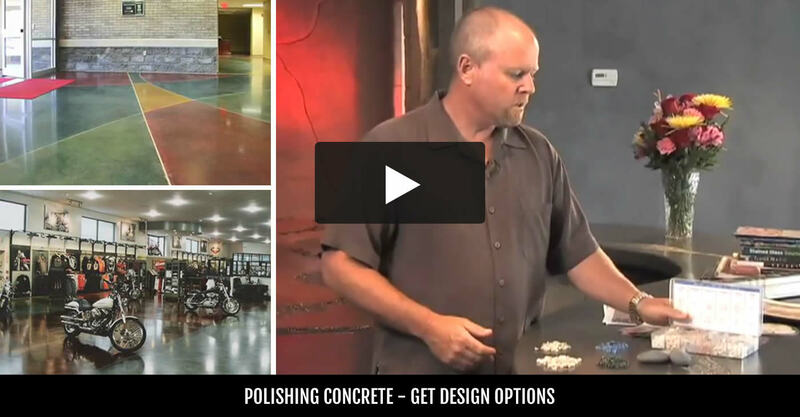 Concrete Polishing Videos Watch videos with expert Bob Harris as he explains the basics of polished concrete. Polished Concrete Overlays Discover why homeowners are choosing polished overlays for flooring in their kitchens and more. Stained Concrete Learn how to use chemical stains to impart gorgeous, earth-toned coloring to plain concrete floors. How Does Polished Concrete Compare? Are Polished Floors Hard to Maintain? Is Polishing a DIY Project? Heavy-duty machines are used to gradually grind down a concrete surface to the desired degree of shine and smoothness, similar to sanding wood. Read more on the basics of polished concrete and the process of polishing. Almost any structurally sound concrete floor, whether old or new, can be polished with proper preparation. However, there are some exceptions. See how to determine your floor's suitability for polishing. WHAT DESIGN OPTIONS ARE AVAILABLE WITH POLISHED CONCRETE? The smooth, reflective surface of polished concrete invites a stunning array of options for coloring, scoring, and creating radial lines, grids, bands, borders and other designs. Stains and dyes are the most popular application for enhancing already existing polished concrete. Check out design ideas and project profiles to get ideas for coloring with stains and dyes, decorative engraving, stenciled graphics, and faux finishes for your own polished concrete floor. WHAT DOES POLISHED CONCRETE COST? Costs for polished concrete will vary by region, square footage, preparation needed, and the complexity of the project and design options; but you can expect to pay between $3 and $12 per square foot. Residential pricing may be slightly higher than commercial because of the need for smaller equipment and tighter spaces. To get a better idea of what you can expect, see Polished Concrete Cost. HOW DOES POLISHED CONCRETE COMPARE TO OTHER FLOORING OPTIONS? Decorative polished concrete offers a number of advantages that other flooring materials can't match, particularly when it comes to durability, performance and sustainability. See how polished concrete stacks up against carpet, tile, vinyl, wood, laminate and natural stone in this comparison chart. ARE POLISHED CONCRETE FLOORS HARD TO MAINTAIN? Polished concrete floors are extremely durable throughout their life, but will need a little maintenance to keep their beautiful shine. The good news is, they are generally easier to maintain than other types of decorative floors. Routine maintenance consists of keeping the floor free of dust and debris that can abrade the surface with dust and damp mopping. Learn more about polished concrete floor maintenance. Images of polished concrete floors with information about slip resistance and traction. Polished concrete floors may look as smooth as glass, but they are completely safe to walk on when kept clean and dry. What’s more, they tend to be less slippery than waxed linoleum or polished marble. In public facilities with heavy foot traffic, however, preventing slip-and-fall accidents is a top priority. Keep polished floors free of oil, grease and standing water. Follow a routine maintenance program, and clean spills and stains from the floor as soon as possible. Apply an anti-slip conditioner. These products contain special additives designed to improve traction and make wet surfaces safer. They must be reapplied periodically, but they can simply be mopped on during routine cleaning. Apply a sealer coat to polished concrete that contains an anti-slip grit additive. These products are simply mixed into the sealer before applying to increase traction without taking away from the appearance of the polished surface. Supplement with rubber mats or area rugs in high-traffic entryways. IS POLISHING CONCRETE CONSIDERED A GOOD DIY PROJECT? Be aware that the process of polishing concrete floors requires a great deal of expertise and the use of specialized heavy-duty polishing machines equipped with diamond-impregnated disks that gradually grind down surfaces to the desired degree of shine and smoothness. Considering the investment in equipment and the skill required, it's definitely not a project for the do-it-yourselfer. 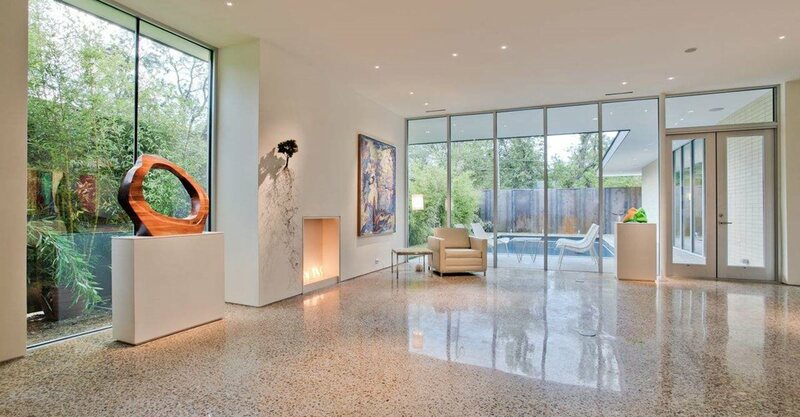 You'll want to hire a professional concrete polishing contractor to do the work. Find a local concrete polishing contractor. 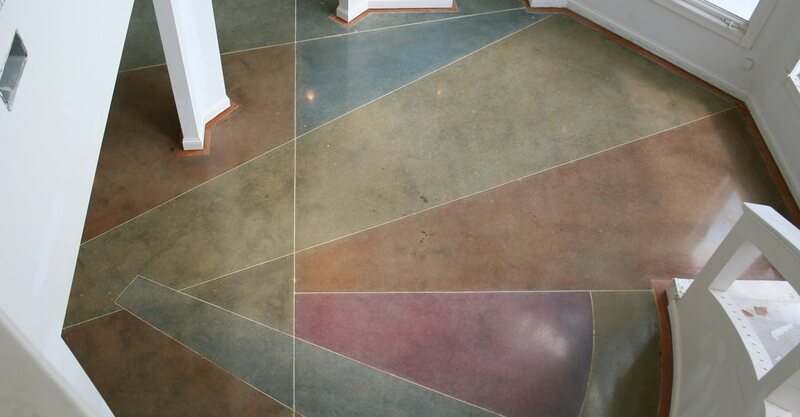 One of the most effective ways to dress up polished concrete is to apply dye. Concrete dyes are available in a much broader color palette than acid stains, and unlike stains, they are not chemically reactive with concrete so the effects tend to be more predictable and less mottled. They also offer more control during application, allowing you to create more intricate graphic designs. Composed of extremely fine organic pigments, dyes penetrate into concrete surfaces to create translucent color effects. You can use dyes alone as a primary coloring agent or in conjunction with acid stains or integral color as an accent shade. Most dyes are compatible with each other and can be blended to create an unlimited range of color variations. You can also achieve interesting decorative effects by applying multiple colors of dye and using faux-finishing techniques. When to apply dye to polished concrete: Dye manufacturers often recommend applying dye at the grit level just prior to the final polishing step and then applying densifier afterward. However, Bob Harris, author of Bob Harris' Guide to Polished Concrete Floors, says he has had good success applying dye at the 400-grit stage and after the slab has been densified, since dyes are soluble and will penetrate readily. Often it depends on the condition of the concrete, so it's best to check with the dye manufacturer for recommendations. Although there is no reason to neutralize the floor after coloring with dye, as is required when using acid stains, you should clean residual dye from the surface to prevent the color from smearing. Harris recommends using an auto scrubber fitted with a vacuum recovery system for large projects and a mop or wet vac on smaller projects. Because dyes usually dry in minutes, final polishing and liquid hardener application can proceed soon after the dye residue is removed. Solvent vs. water-based dye: Some solvent-based dyes are premixed and come ready to use, while others are shipped in dry powdered form and require mixing with acetone before use. You can usually thin dyes with additional acetone if you want to reduce the color intensity. Be aware that all solvent-based dyes are highly flammable, so precautions should be taken when applying them. Wear protective gear such as an approved respirator, safety glasses and protective gloves. Also make sure the room is well ventilated and no open flames are present. Water-based dyes are typically packaged ready to use and require no mixing. Harris says that you can apply water-based dye to polished concrete at the same stage as solvent-based dyes (around 400 grit), but since these dyes are water soluble, you may need to apply the densifier first, especially if the concrete is soft, to make the surface less permeable. Because water-based dyes are free of acetone, they are safer to apply than solvent-based products. Application tools: The best way to apply solvent-based dyes is with a pump-up or airless sprayer fitted with an acetone-resistant cone-shaped nozzle to ensure uniform coverage. Because these dyes dry very quickly, avoid applying them by brush, which can result in brush stroke marks. For small areas of detail, apply the dye with an air brush for the best results. Water-based dyes offer a bit more control and can be applied on small areas with artist's brushes or traditional paint brushes. On smooth surfaces, color-washed appearances can be achieved by ragging or sponging the dye on the surface in a random motion. On open areas, the use of a pump-up sprayer followed by another person massaging the dye into the surface with a microfiber applicator or rayon mop is an effective way of applying the dye. The coverage rate for dye can vary significantly from floor to floor based on the mix design of the concrete, the surface profile, the porosity, and the color intensity you're trying to achieve. Use the coverage rate given on the dye container only as a general guideline. Layering dye color upon dye color is a great way to achieve variation and deeper color intensity. Multiple light applications of dye will achieve deeper penetration than one heavy application. Wait at least 15 minutes, or until the first application is completely dry, before applying a second coat of dye. When using either water- or solvent-based dyes, the dry method of polishing produces better results since wet polishing could reactivate the dye and cause it to bleed. Always apply a test sample of dye before covering the entire floor so you can see the degree of color intensity and how readily the floor is accepting the dye. If possible, conduct the test sample on the actual floor in an area that will not be seen, such as in a closet or storeroom. Dyes are not UV-stable and should generally be used only on indoor concrete. They may fade if applied to outdoor surfaces. Contractors can polish concrete using wet or dry methods, but typically they use a combination of both. Wet polishing uses water to cool the diamond abrasives and eliminate grinding dust. Because the water reduces friction and acts as a lubricant, it increases the life of the polishing abrasives, particularly the resin-bonded disks, which can melt at high temperatures. A disadvantage of the wet process is the mess. Crews must collect and dispose of the slurry that's generated, which slows productivity. Dry polishing requires no water. Instead, contractors use machines equipped with dust-containment systems that eliminate virtually all of the mess. Typically dry polishing is used for the initial grinding steps, when more concrete is being removed. As the surface becomes smoother, and crews switch from the metal-bonded to the finer resin-bonded diamond abrasives, they generally change to wet polishing. However, some manufacturers have introduced resin-bonded disks that are designed to withstand the friction of dry polishing, allowing the entire process to be done dry.